KafkaApis is responsible for handling API requests (by means of handlers) to a KafkaServer and orchestrating interactions between the services. 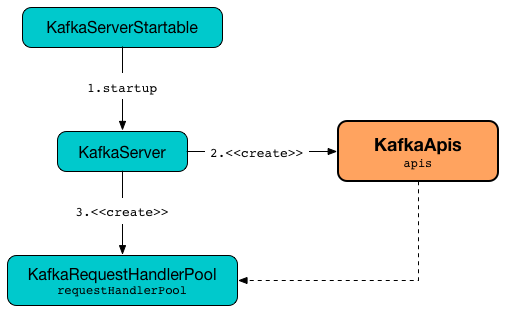 KafkaApis is created exclusively when KafkaServer is started (and creates KafkaRequestHandlerPool). Enable INFO, DEBUG or TRACE logging levels for kafka.server.KafkaApis logger to see what happens inside. That means that the logs of KafkaApis go to logs/kafka-request.log file at TRACE logging level and are not added to the main logs (per log4j.additivity being off). handle then relays the input RequestChannel.Request to the corresponding handler per the apiKey (from the header of the input request). handle is used exclusively when KafkaRequestHandler thread is requested to run. In summary, handleLeaderAndIsrRequest requests the ReplicaManager to becomeLeaderOrFollower. handleLeaderAndIsrRequest takes the LeaderAndIsrRequest from the body (of the RequestChannel.Request). When authorized cluster action, handleLeaderAndIsrRequest requests the ReplicaManager to becomeLeaderOrFollower (with the onLeadershipChange callback). handleLeaderAndIsrRequest is used exclusively when KafkaApis is requested to handle a LeaderAndIsr request. In summary, handleAlterReplicaLogDirsRequest requests the ReplicaManager to alterReplicaLogDirs. handleAlterReplicaLogDirsRequest is used exclusively when KafkaApis is requested to handle a AlterReplicaLogDirs request. In the end, handleCreateTopicsRequest requests AdminManager to create the topics. handleCreateTopicsRequest is used exclusively when KafkaApis is requested to handle a CreateTopics request. handleOffsetFetchRequest is used exclusively when KafkaApis is requested to handle a OffsetFetch request. In summary, handleFetchRequest requests the ReplicaManager to fetchMessages. handleFetchRequest is used exclusively when KafkaApis is requested to handle a Fetch request. handleTopicMetadataRequest takes the MetadataRequest from the body (of the RequestChannel.Request). handleTopicMetadataRequest requests the MetadataCache for getAllTopics or its subset (per topics attribute of the MetadataRequest). handleTopicMetadataRequest filters out the topics for which the current principal (user) is not authorized to execute Describe operation. handleTopicMetadataRequest creates a MetadataResponse.TopicMetadata with TOPIC_AUTHORIZATION_FAILED for every unauthorizedForCreateTopics and unauthorizedForDescribeTopics. handleTopicMetadataRequest getTopicMetadata if there are authorizedTopics. In the end, handleTopicMetadataRequest sendResponseMaybeThrottle with a new MetadataResponse. handleTopicMetadataRequest is used exclusively when KafkaApis is requested to handle a Metadata request. authorize simply requests the Authorizer to authorize the given Operation on the given Resource in the RequestChannel.Session. KafkaApis initializes the internal registries and counters. fetchOffsetForTimestamp is used exclusively when KafkaApis is requested to handleListOffsetRequestV1AndAbove. handleListOffsetRequestV0 is used exclusively when KafkaApis is requested to handleListOffsetRequest (for the API version 0). handleListOffsetRequestV1AndAbove is used exclusively when KafkaApis is requested to handleListOffsetRequest (for the API version 1 or above). In summary, handleDescribeLogDirsRequest requests the ReplicaManager to describeLogDirs. Internally, handleDescribeLogDirsRequest takes the DescribeLogDirsRequest from the body (of the RequestChannel.Request). handleDescribeLogDirsRequest branches off per whether the DescribeLogDirsRequest was for isAllTopicPartitions or not. For all TopicPartitions, handleDescribeLogDirsRequest requests the ReplicaManager for the LogManager that is requested for all the partition logs and their TopicPartitions. For specific TopicPartitions, handleDescribeLogDirsRequest requests them from the DescribeLogDirsRequest. handleDescribeLogDirsRequest returns an empty list of log directories when the request is not authorized. handleDescribeLogDirsRequest then requests the ReplicaManager to describeLogDirs with the requested TopicPartitions. In the end, handleDescribeLogDirsRequest sendResponseMaybeThrottle with a DescribeLogDirsResponse and the LogDirInfos. handleDescribeLogDirsRequest is used exclusively when KafkaApis is requested to handle a DescribeLogDirs request. fetchOffsetsBefore is used exclusively when KafkaApis is requested to fetchOffsets. fetchOffsets is used exclusively when KafkaApis is requested to handleListOffsetRequestV0. In summary, handleStopReplicaRequest requests the ReplicaManager to stopReplicas. handleStopReplicaRequest is used exclusively when KafkaApis is requested to handle a StopReplica request. In summary, handleUpdateMetadataRequest requests the ReplicaManager to maybeUpdateMetadataCache. handleUpdateMetadataRequest is used exclusively when KafkaApis is requested to handle a UpdateMetadata request. handleOffsetCommitRequest takes the OffsetCommitRequest from the body (of the RequestChannel.Request). If authorized, handleOffsetCommitRequest simply requests the GroupCoordinator to handleCommitOffsets (with the sendResponseCallback). If authorized, handleOffsetCommitRequest branches off per API version (i.e. 0 to store offsets in Zookeeper and 1 and beyond). The API version 0 is not described here. handleOffsetCommitRequest is used exclusively when KafkaApis is requested to handle an OffsetCommit request. In the end, sendResponseCallback sendResponseMaybeThrottle a new OffsetCommitResponse. createInternalTopic is used when KafkaApis is requested to getOrCreateInternalTopic and getTopicMetadata. getOrCreateInternalTopic requests the MetadataCache for getTopicMetadata for the input topic (and the ListenerName). In the end, getOrCreateInternalTopic returns the TopicMetadata if available or createInternalTopic. getOrCreateInternalTopic is used exclusively when KafkaApis is requested to handle a FindCoordinatorRequest. getTopicMetadata is used exclusively when KafkaApis is requested to handle Metadata request. handleDescribeGroupRequest is used exclusively when KafkaApis is requested to handle a DescribeGroups request. handleAlterConfigsRequest is used exclusively when KafkaApis is requested to handle a AlterConfigs request. createTopic is used when KafkaApis is requested to createInternalTopic and getTopicMetadata. handleFindCoordinatorRequest takes the FindCoordinatorRequest from the body (of the RequestChannel.Request). For an authorized request, handleFindCoordinatorRequest branches off per CoordinatorType, i.e. GROUP or TRANSACTION. In the end, handleFindCoordinatorRequest sendResponseMaybeThrottle with a new FindCoordinatorResponse. Sending FindCoordinator response [body] for correlation id [correlationId] to client [clientId]. handleFindCoordinatorRequest is used exclusively when KafkaApis is requested to handle a FindCoordinator request. handleJoinGroupRequest takes the JoinGroupRequest from the body (of the RequestChannel.Request) and simply requests the GroupCoordinator to handleJoinGroup (with sendResponseCallback to handle the response). handleJoinGroupRequest is used exclusively when KafkaApis is requested to handle a JoinGroup request. Sending join group response [responseBody] for correlation id [correlationId] to client [clientId]. In the end, sendResponseCallback sendResponseMaybeThrottle with the new JoinGroupResponse. handleAddOffsetsToTxnRequest is used exclusively when KafkaApis is requested to handle a AddOffsetsToTxn request. In summary, handleProduceRequest requests the ReplicaManager to appendRecords (with isFromClient flag enabled). handleProduceRequest is used exclusively when KafkaApis is requested to handle a Produce request. In summary, handleWriteTxnMarkersRequest requests the ReplicaManager to getMagic followed by appendRecords (with isFromClient flag disabled). handleWriteTxnMarkersRequest is used exclusively when KafkaApis is requested to handle a WriteTxnMarkers request. In summary, handleDeleteRecordsRequest requests the ReplicaManager to deleteRecords. handleDeleteRecordsRequest is used exclusively when KafkaApis is requested to handle a DeleteRecords request. In summary, handleOffsetForLeaderEpochRequest requests the ReplicaManager to lastOffsetForLeaderEpoch. handleOffsetForLeaderEpochRequest is used exclusively when KafkaApis is requested to handle a OffsetForLeaderEpoch request. In summary, handleListOffsetRequest requests the ReplicaManager to fetchOffsetForTimestamp. handleListOffsetRequest is used exclusively when KafkaApis is requested to handle a ListOffsets request. isAuthorizedClusterAction simply authorize with ClusterAction operation and ClusterResource resource.